If you believe that it is wrong for the slaughter of cetaceans to continue, then you may want to become part of the campaign to stop these unnecessary deaths. Thousands of dolphins, porpoises and whales are dying in European waters every year, due to entanglement in fishing nets and lines. 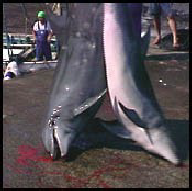 You can help the European Cetacean Bycatch Campaign prevent these needless deaths ~ all you have to do is to send an e-mail or letter. You can also help by signing our Online Petition. If you would like more information, please go to the Current Issues page. "Universal responsibility is the real key to human survival. It is the individual working for the common welfare who makes the difference." 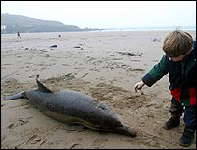 In a 5-week period at the beginning of 2002, the dead bodies of over 100 dolphins were found on the beaches of southern England, and over 400 on the beaches of France. At the end of March, the figure had risen to over 1000. This slaughter must not happen again. We need your help to persuade the legislators and the fishing industry to implement measures to significantly reduce cetacean bycatch in European waters. “Never doubt that a small group of thoughtful committed citizens can change the world. Indeed it is the only thing that ever has”. The Directors of the European Cetacean Bycatch Campaign, Alan and Mary Stuart, are members of the Partnership for Action Against Wildlife Crime, and are represented on the Marine Wildlife Enforcement Working Group. They are also members of British Divers Marine Life Rescue, the European Cetacean Society, the Marine Animal Rescue Coalition, and the Global Whale Alliance. This site contains copyrighted material, the use of which has not always been specifically authorized by the copyright owner. We are making such material available in our efforts to advance understanding of environmental, safety, scientific and consumer issues, etc. “Recent history indicates that man's impact upon marine mammals has ranged from what might be termed malign neglect to virtual genocide. 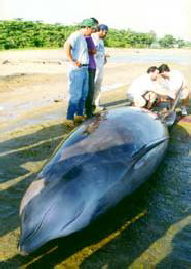 These animals including whales, porpoises, seals, sea otters, polar bears, manatees and others, have not only rarely benefited from our interest; they have been shot, blown up, clubbed to death, run down by boats, poisoned and exposed to a multitude of other indignities, all in the interest of profit or recreation, with little or no consideration of the potential impact of these activities on the animal populations involved”.